Into an empty bottle, put a small amount of matcha (only about a third of a teaspoon — a little bit goes a long way). Add a tiny bit of water to the bottle (only a couple of capfulls). Fasten the cap and shake vigorously. The goal is to make a thick, even matcha paste in the bottom of the bottle. Otherwise, the matcha will form stubborn clumps in the next step. Add the rest of the water, fasten the cap again, and share vigorously. 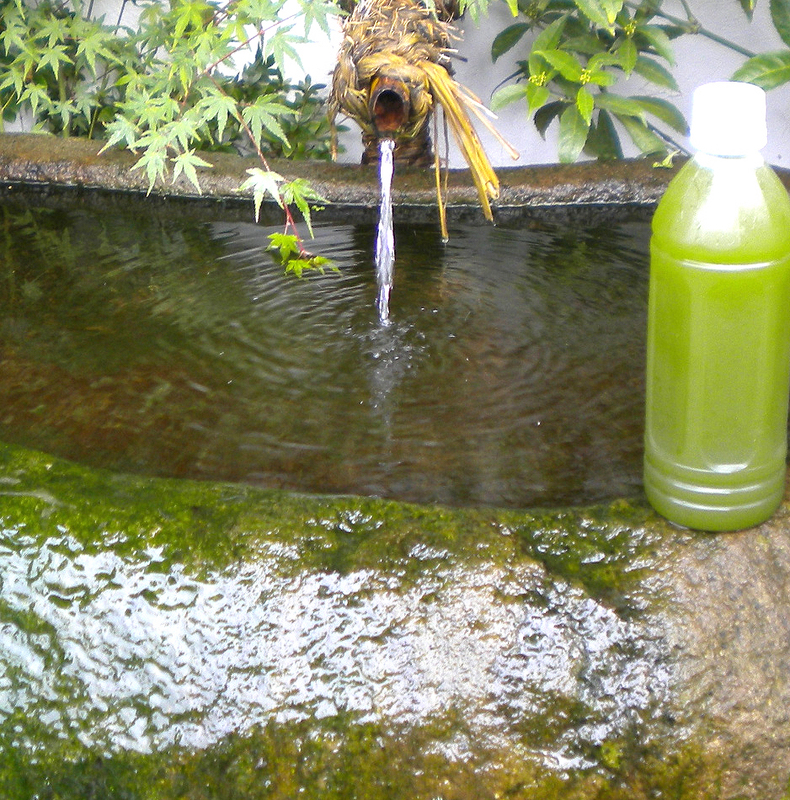 The photo below depicts a really great idea that a tea grower in Aso showed us while we strolled through town: making cold-brewed matcha from the stunningly delicious water from one of the town's natural spring water drinking fountains. On a hot day like that, there is nothing like nice, cold green tea. It really gave us the energy to keep exploring the sights. This is right-from-the-mountain spring water that the city provides for everyone — locals and visitors alike. The water's taste is pure and clean and exquisite yet subtle, and it's body-chillingly cold in a reassuring way. You feel like you've got a direct line to Mother Earth's own water cooler.